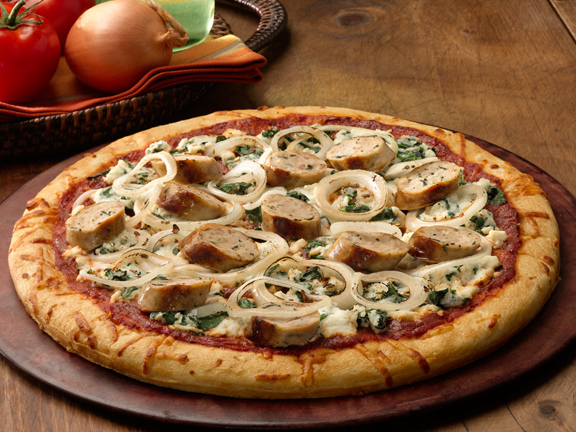 Preheat oven to 450° F. In a medium pan over medium heat, grill al fresco® Spinach & Feta Chicken Sausage. Remove from pan, and slice into 1/4" pieces. Set aside. Sauté spinach in olive oil, remove from heat, and combine with ricotta and Parmesan cheeses, crushed red pepper, and garlic pepper. Spread Boboli® pizza sauce evenly over crust leaving a 1" border around the Boboli® pizza crust. Using a spoon, drop dollops of spinach mixture evenly on crust. Add onions and chicken sausage over pizza. Top with shredded mozzarella cheese. Bake 8 – 10 minutes or until crust is golden and cheese is melted. Enjoy!